Wearing virtual reality goggles, Jordan Holler was hard at work taking apart muscles inside of a body. The first-year medical student at UC San Francisco wasn't touching any real tissues, though. He was using new technology that allowed him to put on a headset and start to "move" anatomy, revealing layers and structures. Then the virtual reality program can be reset to do it over in a new way. His work is part of new curriculum at UCSF that uses cutting-edge virtual reality technology to bridge hands-on training with cadavers and textbook learning. "It helps us understand anatomy much better," he said. Anatomy forms the foundation for much of what a medical student needs to learn and what a doctor needs to know, but it is often a dreaded memorization ordeal and a challenge to see how all the bones, muscles, nerves and organs fit together. "Our instructors do an amazing job, but at the same time it is difficult to get an entire three-dimensional picture of what is going on," Holler said. Cadavers and textbooks have limitations in what they can convey. Virtual reality improves upon learning from a cadaver by its ability to go from the skin layer all the way down to the bones, and back again. Learners can remove every single layer independently and see the different relationships between the muscles and nerves and organs, zooming in to the microscopic level if desired. The process can then be reversed completely back to the skin. "It's a learning experience almost like putting a puzzle together," said Assistant Professor of Anatomy Derek Harmon, PhD. Harmon is using the virtual reality software as part of a research pilot with UCSF Professor of Physical Therapy and Anatomy Kimberly Topp, PhD, PT, in collaboration with medical education technology pioneered in the School of Medicine's Technology Enhanced Education (TEE) group. The instructors and physical therapy student teaching assistants are developing a curriculum for first-year medical students, who will use virtual reality as an optional component in their anatomy curriculum to supplement lectures, traditional two-dimensional textbook and online learning and the cadaver lab. The changes are part of the school's Bridges curriculum, which launched in 2016. 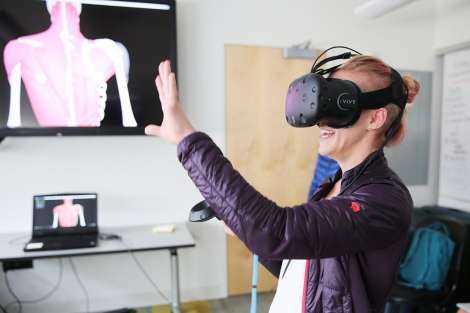 "Virtual reality is exciting for me as an anatomy instructor because it is going to help enhance the students' understanding of the arrangement of the body," said Harmon. "Because the better they know the body, the better physicians they will end up being for the rest of their careers." 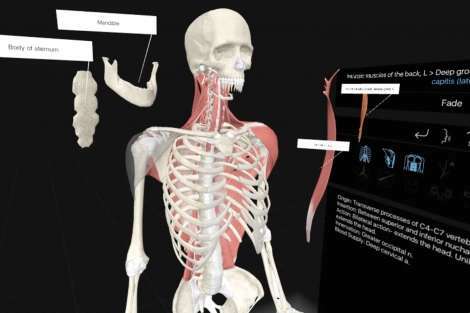 Virtual reality anatomy allows the learner wearing a headset – and observers viewing monitors – to interact with a virtual patient that is upright, much as they would with an actual patient in a clinic. The virtual patient can be viewed from the top or bottom, and can be moved around to uncover spatial relationships. While the 3-D aspect is a huge benefit, Topp pointed out several others. "Anatomists pride themselves in being able to engage students in their learning to experience the wonder of anatomy," she said. "People are really wowed when using virtual reality. That is how I think it is going to help students remember the anatomy that is so dense in their education." Topp also sees the technology assisting more generally in immersion learning, helping learners get used to an environment that is unfamiliar and frightening. "It is hard to simulate a realistic trauma experience where nobody is going to get hurt," she said. A virtual trauma patient allows team members to get used to calming themselves and gaining control over their emotions, thoughts and actions to be useful in the situation. "This is a great way to get students more comfortable with the actual clinical environment that they are headed into," she said, adding that another bonus is the training in communication skills among team members and in immediate decision-making. Christian Burke, the director of technology innovation with the Office of Medical Education, and the other TEE team members are eagerly planning what else can be done with the technology, including building their own models and using it to simulate surgery, clinical cases and injuries. For example, a discussion of the anatomy of the lower limb might be immediately followed by a virtual reality situation in which a team needs to apply that anatomy to an emergency, such as a traumatic injury. The student is able to practice communication of their knowledge, provide direction for team members, and make clinical decisions in a stressful but safe environment. And then they can do it again in a different virtual clinical environment. "This has the potential to take us to the next level of experience so we can go from general anatomy learning to an environment where anatomy has been disrupted and the student has to act on it," said Topp. "This technology takes anatomy learning and applies it almost immediately."